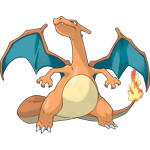 Charizard is the sixth Pokemon on the National Pokedex and was introduced as a Stage 2 Pokemon in Generation 1 (Red, Blue, Yellow). 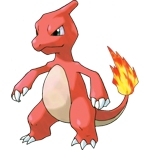 Charizard is a Fire/Flying type Pokemon. 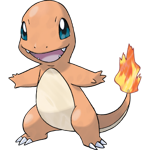 The starter Charmander evolves at level 16 into Charmeleon who evolves into Charizard at level 36. Starting in X and Y Versions, Charizard can evolve into Mega Charizard X by using Charizardite X or Mega Charizard Y by using Charizardite Y in battle.